It was revealed yesterday Facebook paid users $20 to sideload a VPN onto their devices, allowing the social network to monitor what participants aged 17 to 35 did online. 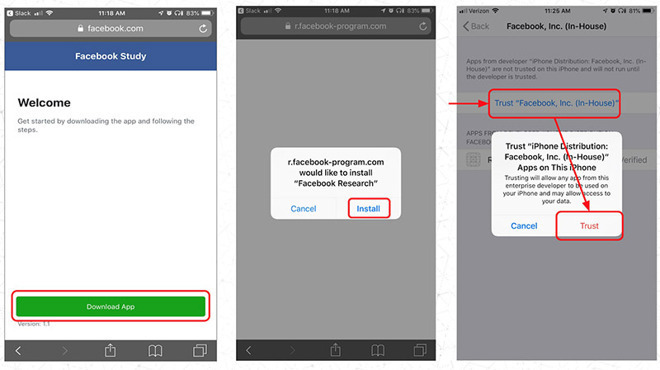 Claimed to be a “social media research study,” the Facebook Research iOS app took advantage of Apple’s Enterprise Developer Certificates to allow the apps to be distributed separately from the main App Store, as well as effectively providing root access to a user’s device. The revocation is a serious measure, as it has not only affected users who used the certificates to install the monitoring app, but also to internal tools being “dogfooded” by the company before being made public. The loss of multiple apps, including those used by employees as part of their job, is causing considerable disruption to work in Facebook, and could take a long time to rectify, if Apple permits it use of Enterprise Developer Program certificates again. Public versions of the social network’s apps are still available to download and use, as the revocation only applies to apps using enterprise certificates, not consumer-facing variants. That said, there may still be some impact, as it will affect the development of new features that may be added to apps in the future. A report from December claimed Facebook had made special data sharing arrangements with other tech companies, enabling Facebook to collect more data on its users generated on Apple devices, without either Apple or the users’ permission or knowledge.